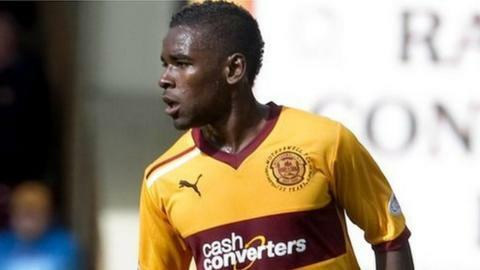 Former Motherwell player Zaine Francis-Angol has joined the National League's bottom club Kidderminster Harriers. The 22-year-old ex-Tottenham Hotspur youth player, who can play at left-back or on the left side of midfield, has signed a short-term deal until January. "I'm looking to get back in the game. Kidderminster looks a good place to do that," Francis-Angol said. "Things didn't go well for me at Motherwell last season with injury and a new manager coming in." After progressing through Spurs' youth system, Francis-Angol went on to make 76 appearances in his four seasons with Motherwell. He was given his debut by Stuart McCall in August 2012, but never figured under new Well boss Ian Baraclough following McCall's departure last November. "From what I've seen in training this is a good set-up. Everything is high tempo. The standard is good. It doesn't really reflect the league position." Harriers have received international clearance allowing Francis-Angol the chance to make an immediate debut in Saturday's home game with Welling United at Aggborough. The London-born Antigua & Barbuda international is Harriers' first signing since football development director Colin Gordon took charge of the first team on 21 September. The World Cup's most interesting man?